Add two or three days for non-standard ink colors. 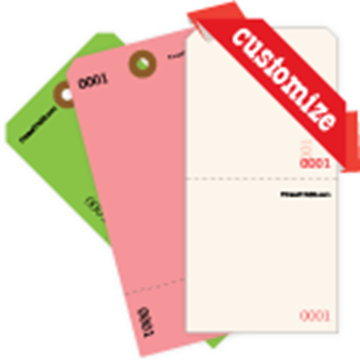 Consecutive numbers are printed above and below the perforation, add your personalized text and company logo. 13pt. (175#) tag, choose stock color. Personalized message — front only, one color. Provide your own mock-up or sketch. PDF proofs will be e-mailed before printing. There is no charge for artwork set-up or proofing.